CHARLESTON, S.C. — Years ago, acclaimed author and former Citadel basketball player Pat Conroy wrote about how one of the most ridiculous college football rivalry pranks went horribly awry. With a 1963 game against arch-rival Furman coming up that weekend, Conroy described how a group of Citadel cadets attempted to kidnap the Paladins’ white horse, Waldo, which its Knight mascot rode during games. Legend, which has been furthered along by the late and popular South Carolina writer in his novel “Beach Music”, has it that the horse was blinded during the abduction, leaving the Bulldog students with a conundrum of how to solve their sudden problem. Though Waldo died in Conroy’s slightly fictionalized account, newspaper reports at the time said he survived with one good eye, but was retired for a new horse the following year. For years played at the end of the regular season in recognition of the historic nature and intensity of the Southern Conference’s oldest and most-contested football series, Furman and The Citadel should have no trouble warming up the competitive early season juices when the two long-time rivals do battle this Saturday in a 6:00 p.m. clash at Johnson Hagood Stadium in Charleston. The contest on Saturday will mark the 96th meeting between the Paladins (0-0, 0-1 SoCon) and Bulldogs (1-0, 1-1 SoCon) since the Palmetto state schools first met in 1913. Furman and The Citadel have played every year since 1919, except for a three-year hiatus (1943-45) during World War II, and have battled as SoCon foes since 1936. The Paladins lead the all-time series 58-34-3, with the 58 wins marking the most against any foe in the program’s now 111-year history. Furman sports a 23-20-2 record in Charleston and has won two of the last three meetings at Johnson Hagood Stadium, though The Citadel captured the last clash in Charleston, a 42-35 overtime verdict in 2014, and the most recent donnybrook, a 38-17 decision in Paladin Stadium a year ago. The Citadel game marks the second in a string of four challenging September contests for the Paladins, who will battle Chattanooga (Sept. 17), last year’s league co-champion with the Bulldogs, before wrapping up their first month of play at FBS transition foe Coastal Carolina on Sept. 24. The Chanticleers, for some illogical reason, are ranked No. 17 in this week’s STATS FCS Poll despite not being FCS playoff eligible or no longer recognized statistically by the NCAA. Saturday’s clash, which will be carried by ESPN3, will be radio broadcast over the Furman IMG Sports Network headed up by flagship station FoxSports 1440/Greenville. It will also be available via in-stadium transmitter (107.7 FM) and audio streamed over TuneIn.com, which is also accessible through FurmanPaladins.com. Furman’s ticket allotment is sold out in the now-half sized Johnson Hagood Stadium — the once-Confederate graveyard that recently had its east stands condemned due to lead paint issues. Fans needing tickets must now purchase them online through The Citadel or via phone at (843) 953-3647. Furman fans who placed ticket orders within the school’s allotment can claim them at will call at Gate 9 at Johnson Hagood Stadium starting 90 minutes before kickoff. The Paladins kicked off the season playing the highest ranked opening game opponent of any FCS school, falling to 12th-ranked and defending Big Ten Conference champion Michigan State, 28-13, on Sept. 2. The Citadel, meanwhile, initiated its defense of the school’s 2015 SoCon co-championship last Thursday with a late fourth quarter field goal that trimmed SoCon foe Mercer, 24-23, in Macon, Ga.
After yielding an early touchdown to Michigan State, a 12-2, FBS playoff semifinalist a year ago, Furman matched the Spartans fairly evenly the rest of the way. A pair of Jon Croft Hollingsworth field goals got the Paladins on the board, and a fourth quarter Antonio Wilcox 6-yard touchdown run pulled Furman to within 21-13. Linebacker Byron Johnson’s interception at the Spartan 44-yard line with 11:49 to go gave the Paladins their best opportunity to draw even, but Michigan State avoided the threat with its own pickoff, which it followed up with a 60-yard scoring drive and score with 4:55 left to seal the outcome. Freshman tailback Darius Morehead impressed in his collegiate debut, rushing 20 times for 83 yards against the Spartans, and junior quarterback P.J. Blazejowski passed for 130 yards, completing 15-of-30 attempts. 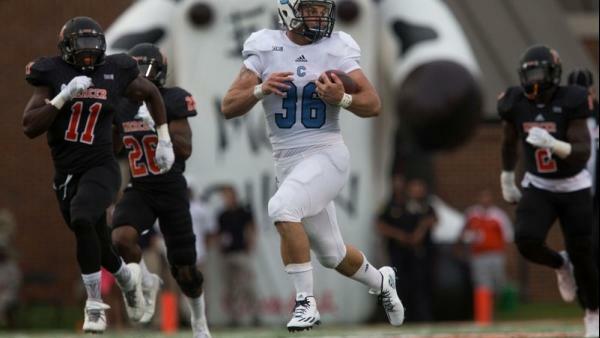 As a freshman in 2014, Blazejowski threw for 307 yards and three touchdowns and rushed for 75 yards and another score against The Citadel in Charleston. Furman’s defense was paced by senior preseason All-America safety Trey Robinson’s game high 13 tackles against Michigan State. The Paladins also notched two sacks in the contest and used a third quarter fumble recovery by sophomore cornerback Aaquil Annoor to set up a score.